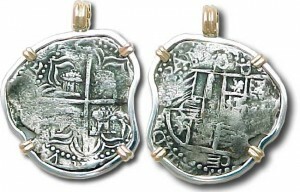 Belleair Coins buys and sells shipwreck coins, treasure coins and all Spanish Colonial coins and artifacts. We are the Cob coins authority in the Tampa Bay area and know the market very well. We invite you to bring in your treasure coins and other artifacts so we can provide an analysis and provide you with a free estimate. Atocha coins are those recovered from the shipwrecked, “Nuestra Senora de Atocha”, a Spanish galleon that was carrying gold and silver coins and bars from the new world to Spain. On September 6, 1622, the Atocha was sunk by a hurricane while sailing near the Florida Keys. The coins that were recovered by Mel Fisher’s company, “Treasure Salvors Inc.”, are called cobs as an abbreviation of the Spanish phrase, “Cabo de Barra”, which means cut from a bar. “Cabo” was eventually shortened to cob. These irregularly shaped coins were made by cutting coin blanks from a bar that resembled an old tire iron, and then hand hammered. The front of the coins all have a large cross, and the reverse a shield of the Spanish Kings. The location on the coins where the date would be visible is out near the rim, and due to poor minting techniques the dates are rarely visible. The denominations of the Atocha coins were 8 real (dollar sized); 4 real (half dollar sized); and two real (nickel to quarter sized). When minted, eight reals weighed 27 grams. Many more eight reals were recovered than all the other sizes. Grade 1.. Nice coins. Only slight corrosion and nice strong strikes; probably weigh close to minted weight of 27 grams. Grade 2.. Still nice coins but a little less attractive than grade one because of some small but noticeable problems. Grade 3.. A definite, noticeable drop-off from grade 2 coins. These are sometimes poorly struck or have very noticeable corrosion or other obvious problems. Grade 4.. Some of these are so terrible it’s hard to make out many details, yet others are eaten-up on just one side but not all that bad looking. Smart buyers will always want to look before buying a grade four coin. When the Atocha was discovered in 1985, there were many thousands of coins to be processed and graded, and things were done in a hurry. It is general consensus among dealers that Mel Fisher’s coin graders made a few mistakes. I have seen many Grade 1 coins that I felt should have been in the Grade 2 category and visa versa, and the same with all denominations. Treasure Salvors displays Atocha treasure and artifacts at the Treasure Museum in Key West. At the gift shop there, Atocha coins are sold, mostly to tourists at prices much higher than at coin shops. Many huge loaf of bread sized silver bars have been salvaged from the Atocha shipwreck. Most weigh around 800-1100 troy ounces and sell for 10-50% over the silver price, depending upon the markings on the bars, and supply and demand. The nicest ones are designated by Fisher’s grading as Class Factor 1.0, and are dated. Class factor .9 are not as sharp but still very nice and no dates. Class factor .8 bars are fairly washed out but marking still visible. Bars .7 are really washed out, barely identifiable. Very few two escudo gold coins have been recovered from the Atocha. The few that are available sell in the $5000+ price range. Mel Fisher died in early 1999 and this has not affected the price of Atocha coins. His family continues salvaging and marketing treasure coins and artifacts. Their operation in Key West continues. We buy and sell all Spanish coins and Spanish Colonial coins. We sell authentic treasure and ancient coins set in 14K hand made frames at very reasonable prices. We are full-time, knowledgeable coin dealers in treasure coins and jewelry. We know this market and are very competitive. Call us at 888 436-6463 for any questions or inquiries.